LACING: Light and wispy. Just streaks, really. NOSE: No hops in the nose. It seems to be a very subtle blend of dark chocolate, espresso beans, and whole, roasted oats. Pleasant, if a bit mild. TASTE: The flavor is as subtle as the nose. 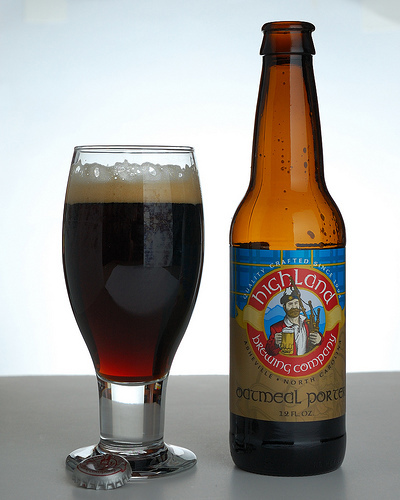 Toasted oats and almonds, a hint of chocolate and coffee, and a mild, fairly clean finish. You don’t see a lot of oatmeal porters out there…oatmeal tends to be paired with sturdier stouts. But I like this style quite a bit. MOUTHFEEL: Silky and actually a bit thin-bodied. DRINKABILITY: Very high for a porter. It’s not heavy in the slightest. This is a smooth, session beer with just enough character to keep you coming back for more. Posted in Tasting Notes.Tagged Highland, Oatmeal Porter, Porter. Head: Minimal head. Dispersed quickly. Taste: Malty caramel molasses, slightly sour-lactic on finish. Who says the Hops rating is subjective? Next Post NO NEW BELGIUM IN NEW YORK?